Mark Harris - Licensed to Dotdash.com, Inc. If you're serious about building up your Windows Media Player 12 library then you'll want a quick way of adding all your song files. Rather than just opening files from your hard drive, it's far easier to configure Microsoft's player to monitor folders. By default, WMP 12 already keeps tabs on your private and public music folders, but what if you've got other locations on your computer or even external storage? The good news is that you can add more folders for Windows Media Player to keep an eye on. The advantage of adding locations on your computer for WMP 12 to monitor is that your music library will be kept up-to-date -- useful for syncing the latest music to your MP3 player etc. If the contents of your hard drive's folders ever change, then this will be reflected in your WMP's music library. In this guide, we will show you how to add folders for WMP 12 to monitor. You'll also see how to change the default save folder, and remove any that are no longer needed. 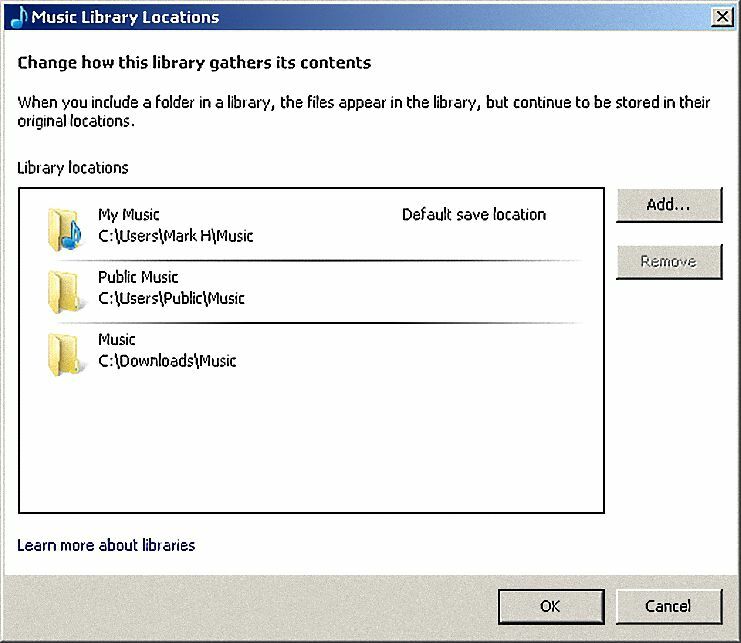 In order to manage the music folder list in WMP 12 you'll need to be in library view mode. If you need to switch to this view then the quickest way is to hold down the CTRL key and press 1. To see a list of music folders that WMP 12 is currently monitoring, click the Organize menu near the top left-hand side of the screen. Hover the mouse pointer over the Manage Libraries option and then click Music. To add a folder on your hard drive that contains music files, click the Add button. This action doesn't actually copy anything. It just tells WMP where to look. Locate the folder you want to add, left-click it once and then click the Include Folder button. To add more locations, simply repeat steps 3 and 4. If you want to change which folder is used to save new audio files, then right-click on one in the list and then choose the Set as Default Save Location option. This is useful for example when you want one central location for all your music. If you rip an audio CD then all the tracks will go to this new default location rather than the original My Music folder. Sometimes you'll want to remove folders that don't need to be monitored anymore. To do this, highlight a folder by clicking on it and then click the Remove button. Finally, when you're happy with the folder list, click the OK button to save.